Wallace was born in Pittsburgh, Pennsylvania. He made his major league debut in 1894 as a starting pitcher with the Cleveland Spiders. After a 12–14 record in 1895, Wallace played outfield and pitcher in 1896. In 1897, Wallace was an everyday player as he became the team's full-time third baseman, batted .335 and drove in 112 runs. In 1899, Wallace moved to the St. Louis Perfectos (renamed the Cardinals in 1900) and changed position to shortstop. He hit .295 with 108 RBI and 12 home runs (second in the league behind Buck Freeman's 25). Wallace changed teams again in 1902, when he joined the St. Louis Browns. His playing time began decreasing a decade later, with his last season as a regular coming in 1912. Wallace played in just 55 games in 1913, and never played that much again for the rest of his career. 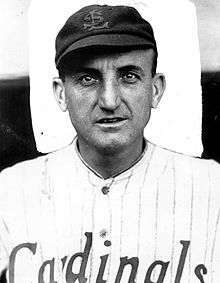 In July 1917, he returned to the National League and the Cardinals, and played in just eight games that season. After batting .153 in 32 games in 1918, Wallace retired with a .268 career batting average, 1059 runs, 34 home runs, 1121 RBI and 201 stolen bases. He played his last game on September 2, 1918 at the age of 44 years and 312 days, making him the oldest shortstop to play in a regular-season game. The record was broken by Omar Vizquel on May 7, 2012. He played for 24 seasons, and holds the record for the longest career by a player who never played in a World Series. When his playing time diminished, Wallace managed and umpired. He managed the St. Louis Browns in 1911 and 1912 and the Cincinnati Reds during part of the 1937 season. He compiled 62 wins and 154 losses for a .287 winning percentage as a major league manager. He also managed the minor league Wichita Witches in 1917. He umpired in the American League in 1915, working 111 games. Upon retiring, he also became a scout. Wallace was inducted into the Baseball Hall of Fame in 1953. ↑ "Omar Vizquel turns 45 with a chance to become the all-time elder statesman among shortstops". Yahoo! Sports. Retrieved 24 April 2012. Wikimedia Commons has media related to Bobby Wallace.